Sir Winston Churchill called Uganda ‘The Pearl of Africa’ and, with its amber earth, emerald forests and moody graphite sky, it’s easy to agree that this country is a jewel of the continent. However, what is hidden in those forests is more precious than any stone. Their rarity is one of the planet’s greatest tragedies but to see one of the last remaining jet-black mountain gorillas in the wild is a moment you’ll treasure forever. Be warned though, like any good hunt for gold, you’ll have to work hard for the prize! Bwindi Impenetrable National Park (called that for a reason!) is about a 4-hour drive from Queen Elizabeth National Park and is home to Uganda’s star attraction. This misty equatorial rainforest is Uganda’s oldest and most biologically diverse. Here, nearly half of the world’s remaining mountain gorillas can be found (around 340 individuals) and several groups have been habituated to humans so can be tracked. Tracking them sounds easier than it is. The gorillas are wild so they can be very near basecamp or so far away that hours and hours of extremely challenging trekking is required. Also, there is no guarantee of finding them at all, however, the rangers leave at dawn to help locate the groups for the tourists. Hearing their deep, contented grunts just before catching a glimpse of these huge, human-like apes is the most thrilling feeling in the world. You only get one-hour with the gorillas and the permits are expensive but it’s a once in a lifetime experience that is humbling and exhilarating all at once. 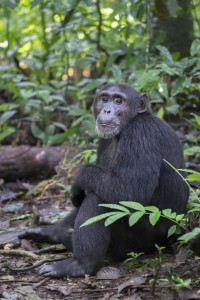 The same rules apply as for tracking chimps and spreading infectious diseases to these endangered animals is a huge concern. 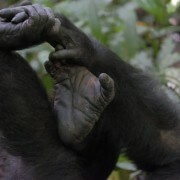 However, without ecotourists visiting rainforests to see the gorillas, it’s more than likely they’d already be extinct. To get to Uganda, I flew to Entebbe and had a wonderful guide called Brian who drove me to the national parks (a Ugandan driver is recommended as the roads are not smooth sailing). In Bwindi, I stayed at Chameleon Hill Lodge, which has phenomenal views of Lake Mutanda. 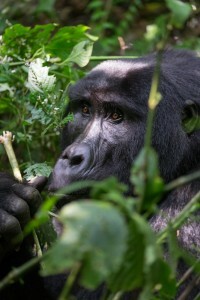 I travelled to Uganda in June (in the dry season) but gorilla tracking operates all year round. Just be sure to purchase your permits in advance if travelling in the high season. I booked my trip through Inspired Escapes.